One of the best ways to create an inviting home environment is to serve delicious food made with love to your people. Those two qualifications play off each other - food becomes delicious when served with love and people feel loved when offered food. In other words, you don't have to be a fabulous cook to love your people well. I live with 5 amazing teenagers at the time of this writing. It's one of the best seasons of our family's life - this relating to people who are becoming adults. It's been one of the most challenging and heartbreaking seasons for me personally but oh, how it brings me JOY to spend time with my children, and nothing gets their attention - especially the boys - like a delicious meal. Electronic devices are abandoned and for those few precious moments as they eat, I feel like they see me again. Funny, huh? 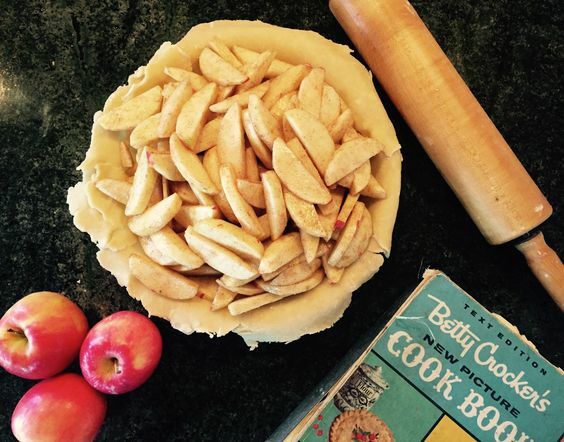 Today I wanted to share my recipe for Apple Pie and a bit about why it's become one of those specialties in our house that makes everyone happy. It's my Grandma Helen's recipe and her genius was really in the crust, so that's the important part. It's just the old Betty Crocker recipe for a double pie crust but, as with much of cooking, technique makes all the difference. In my case, I have my grandma looking down from heaven over my shoulder as I bake, and I'm happy to teach you what she's been whispering to me all these years. Wink! Combine flour and salt in a bowl. Add Crisco in chunks and cut in with a pastry blender until bits of Crisco are the size of peas or lentils, Add water a few Tablespoons at a time, tossing lightly with a fork, until the dough comes together. Do not knead - handle as little as possible. Gather into a loose ball, divide in half and roll out on a floured surface until 1/2cm thick. Place in pie plate. Mix apple slices with sugar and cinnamon to taste. Toss with flour and pour into crust until apples are piled high. Add bits of butter. Roll out other half of dough and put over top, trim overhang to 1 inch and fold over edges, tucking into sides of pie plate. Cut slits in top crust, sprinkle with 1 T sugar and bake at 425 degrees for 50-60 minutes. If edges get too brown, cover edges with 1 inch strips of aluminum foil. You can do it!!! Enjoy this old-fashioned dessert with the people you love. A trip to the apple farm or local farmer's market makes this baking even more of an event or seasonal tradition. 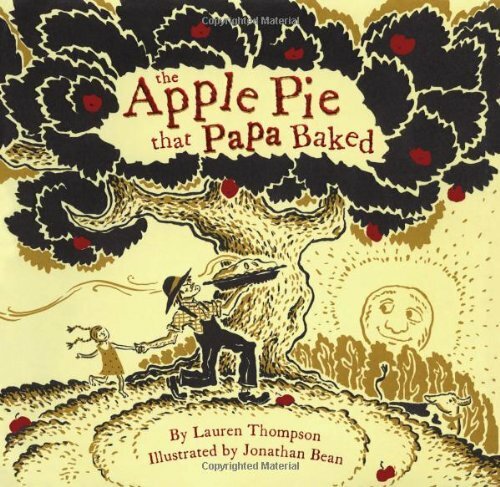 One of our favorite fall books has been this one, The Apple Pie that Papa Baked by Lauren Thompson. Her verse is charming and children absolutely LOVE how it builds and repeats. Jonathan Bean's illustrations are gorgeous and it's fun to search for the different animals on each page. Happy Thanksgiving, Happy Fall, and happy pie-making!